Phoenix Tapes USA proudly offers the option to private label all Phoenix masking tapes at a low cost. 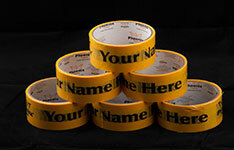 Each tape core and product label can be customized with a company name and logo. In addition, other pertinent information that is needed to support your business can easily be added. Each roll is professionally printed and quality checked to ensure the highest customer satisfaction before delivery. Phoenix Tapes can custom formulate almost any type of pressure sensitive adhesive tape for different applications including: papers, plastics, fabrics, rubbers, acrylics, wallboard for applications from packaging to masking. Phoenix Tapes has diverse custom converting and packaging capabilities including Razor slitting, score slitting, printed roll wrap, accordion packs, flat packs, special bulk packaging and many other innovative packaging solutions tailored to your needs.